Toyota’s new Japan-only kei car looks like something that belongs in a Disney movie. And its name, Pixis Joy, is straight out of Disney World, too. Offered in three different versions with a variety of customization possibilities, the Pixis Joy almost seems like something that could’ve worked for Scion, that, less-than-dearly departed “youth” brand. 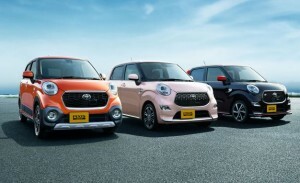 Developed and built by Toyota’s partner Daihatsu, the Pixis Joy fits into Japan’s popular class of kei cars, all of which must be less than 133.9 inches long and use an engine smaller than 660 cc. The Pixis offers both naturally aspirated and turbocharged three-cylinder engines making either 50 or 63 horsepower, both mated to a standard CVT. All-wheel drive is available on certain models.